Set Up Your Kids Swing Sets In Record Time! We know how frustrating it can be to waste time setting up complicated swing sets ...but Not Anymore! Your kids will be calling you a Superhero when they see how Quick & Easy you install their web tree swing! Delivered to your door, unpack your Mommy Please swing seat with peace of mind that you will have your outdoor swing set up in no time. It's not a magic trick... we just know how to make a product that's Simple To Build & Innovative in Design so you can enjoy a Premium Experience! Are You Ready To Treat Yourself & Your Family to a Premium Experience?! Long Lasting Quality is valuable, and we've done the R&D to ensure this tree swing is the only one you'll ever need to own! We put in the hours & did all the complicated work finding the quality material, so you don't have too. You & your family Deserve to own the Highest Quality chair swing ...it's time to treat yourself to it! It's Time To Invest In Endless Play That Adapts & A Gift that Keeps Giving! Congratulations! You've found the Secret to Safe Outdoor Play that makes your kids stronger while freeing up invaluable time for you. How? Well... With the Best web kids swing on all of Amazon, your kids will find endless ways to occupy their time. Did we mention your modern tire swing is not just for 1, but 2 Kids?! Sizing in at 39 inches & with a 400 lb weight limit, the Mommy Please web rope swing is perfect for a young duo or even adults! You'll Get All Your Money Back - no questions asked! So if You're Ready to watch your kids Laugh With Friends, Play Outdoors for Hours, and Have Fun with your Premium Net Swing...Click Add to Cart Now! EXTRA ATTENTION TO DETAIL & SAFETY !- Along with Healthy Happy Fun, the Safety and Security of the children in your life is our top priority at Mommy Please. With superior attention to detail, we've crafted a spider web swing that leverages premium materials and engineering for your well-being! Although we don't recommend the Mommy Please outdoor swing chair to support over 400lbs, we've fastened your web swing with a secure double braided rope with a tensile strength of 2,550 lbs... Wow! EASY ASSEMBLY & COLLAPSABLE STORAGE !- Unlike many other outdoor swings for kids ...your Mommy Please web tree swing is equipped with Fast & Easy Assembly! This allows you to install your kids swing set in no time flat! Arriving at your door step ready to install for Endless Hours of Outdoor Fun, simply follow the included instructions and you can expect Smiling Faces and Warm Hearts. And when it's time to come inside, your web tire swing collapses for hassle-free storage & travel! WEATHER RESISTANT & ULTRA DURABLE !- Rain or Shine, we've got you covered! Made with an Ultra Durable and Super Strong nylon webbing, this web swing seat is Built To Last! And because we've used premium nylon and roping with a 2,550 lb tensile strength, weather is the least of our problems. We all know kids can be... a bit destructive... to say the least. But we've made your Mommy Please web rope swing as child safe, child resistant, yet child fun as they come! FITS 2 KIDS & OVER 400 LBS !- Like we mentioned above, Safety & Fun are our #1 priorities here at Mommy Please. To make sure you get the Best of Both Worlds, we've ensured your Large 39" diameter web swing sets are easily compatible with outdoor playsets or can even double as a Super Unique patio swing ...And because it's rated to hold 400lbs and up to 2 kids, if you're a big kid at heart, you're bound to have endless hours of fun too! 100% SATISFACTION GUARANTEE !- Our Mommy Please promise is for you and your family to have Endless Hours of Outdoor Fun and Playtime! 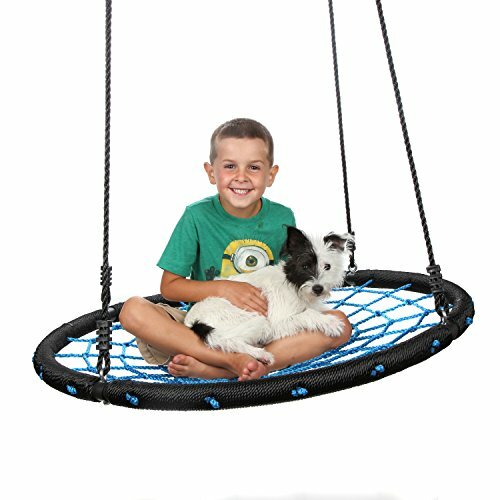 So if you're excited to Own and Enjoy this Fun, Playful, Long Lasting, and Easy to Use web chair swing ...Click Add To Cart Now (risk free)! You're 100% Protected by our Swing Away Guarantee! But HURRY... This reduced price Won't last long, so reach out and take hold of this Investment In Your Child's Fun while you still have the Opportunity! If you have any questions about this product by Mommy Please, contact us by completing and submitting the form below. If you are looking for a specif part number, please include it with your message.